What Is Going on With Archie’s Shipping Dates? Leaving aside the increasing reliance on variant covers — a tactic that now takes up most of the “Everything’s Archie” promo page in the back of the comics — I found this list rather interesting for how many delayed titles were on it. I understand that they don’t advertise Afterlife With Archie, given its adult material, but the rest of these dates are wrong, to varying degrees. The two books listed as now on sale are likely to show up later this month from Diamond. Now, it’s not surprising when the comic distributor ships a week late — it’s happened with other publishers. Sometimes they promote their books being available without taking into account the distributor’s processing time. But this in-comic list, which comes directly from the publisher, is incorrect more often than not. What value does it have as a promotional tool, then? Let’s look again at that first set of books, scheduled for April 22. Betty & Veronica #271 hasn’t shipped through comic shops yet, making it at least a month late. Mega Man #36 came out April 30. 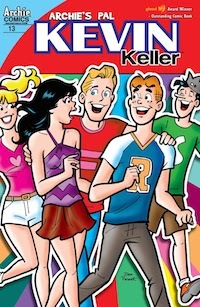 And World of Archie Double Digest #39 came out last week, May 7. When the dates are off by more than a week, I have to wonder what the reason for the delay is. If this was a smaller, less reputable company, I’d be speculating on which bills they are late paying, the printer or the distributor. But that can’t be the case here, can it? One fan reports that a notable mail-order dealer notified him that “pre-orders for B&V #272 were cancelled.” That’s likely a result of the book getting so late that orders needed to be resolicited, although others jump to the conclusion that the title could be cancelled without anyone much caring. These delays also make the advertising outdated, as the May 14 issue of Archie is promoting Free Comic Book Day, which happened on May 3. At least that’s one outside company ad, since most of the rest (with the exception of a Batman bust and a Lego Star Wars book?) are for Archie’s own publications. That’s not a bad thing, except they’re all offered on discount — 20% or 33% or 48% off cover price.